Social Branding - How many companies do a great job of managing all of their social channels and presenting them so that visitors know and understand that they're engaging with the same brand from Facebook to Google+ to LinkedIn to Yelp? Know your market - Your brand should be influence by your target audience. Company name - Things to consider; products and services target audience value you offer, be Easy to remember. Company message - The message who you are and incorporate the values of the company. Logo design and colors - Your logo, visual trademark - Your logo is a graphic image that should visually represent your business at a glance. Colors & Graphics - Graphics, fonts, shape and colors are all incorporated into the identity of a business. Website Design - Company website may be the first time a client will see your brand. Make sure it sends your message. Deliver Consistent Messaging - Develop a voice that speaks to what your company is all about. Your social updates represent your company so it's important, first of all, to maintain a professional voice, and second, to be consistent. Visitors should know what to expect when browsing your social profiles. Tactical-Moves offers affordable online solutions to increase sales and streamline your business. 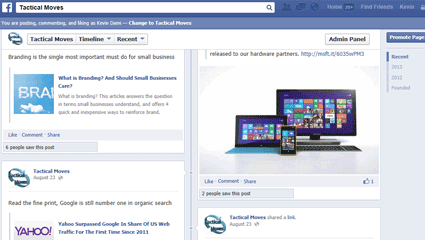 Small businesses now have an affordable solution on managing thier Facebook activity. Getting your company visible and sending a powerful message through online marketing. Branding strategy for small business will build a positive image and loyal client following. Follow us and stay connected in your favorite flavor! Small business affordable solutions for sole proprietors and companies under 20 employees that have difficulty keeping up with today's demand of online activities. Host Small Business offers FREE HOSTING, affordable website templates amd social media management presented by Tactical-Moves Inc.
Website Design Company Coverage Area - Boston, Cambridge, Lowell, Worcester, Springfield, New Bedford, Brockton, Quincy, Lynn, Fall River, Newton, Lawrence, Somerville, Framingham, Haverhill, Waltham, Brookline, Plymouth, Weymouth, Braintree, Marshfield, Hingham, Scituate, Pembroke, Rockland, Massachusetts.